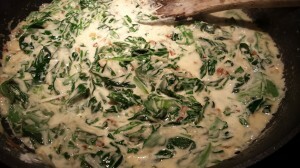 Garlicky Creamed Spinach and Arugula. 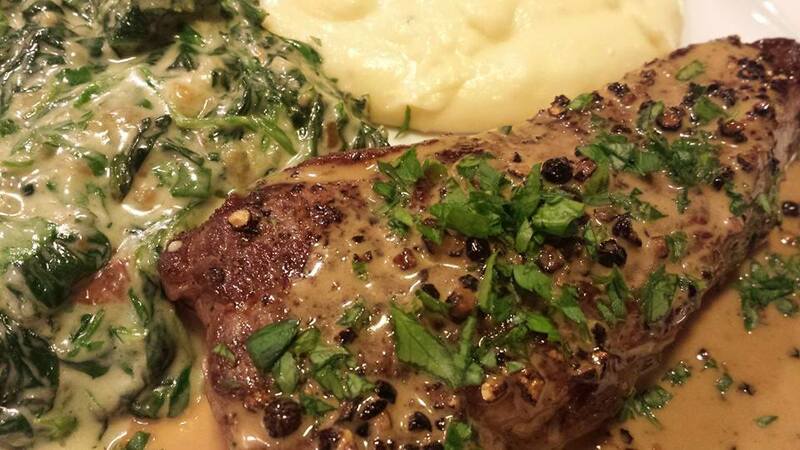 One of my favorite sides to a juicy steak is creamed spinach which I love to order at local steakhouses. 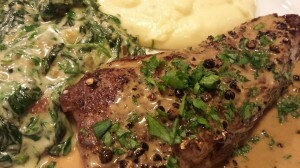 For Christmas Dinner this year, my husband made Steak au Poivre. 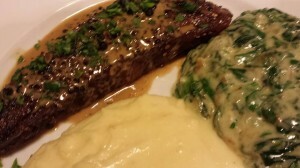 It’s a peppery seared steak dish with a rich cognac sauce which he served alongside my Easy Mashed Potatoes. 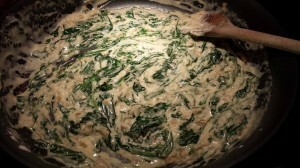 I came up with this tasty Garlicky Creamed Spinach and Arugula side dish that we deemed worthy of a posting on this site! 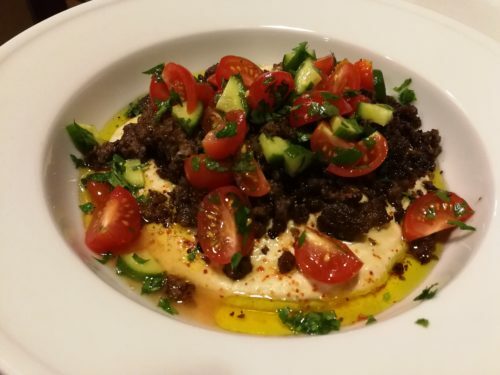 It’s usually clear whether a restaurant is making its own dishes from scratch, or whether it’s just heating up prepared foods. 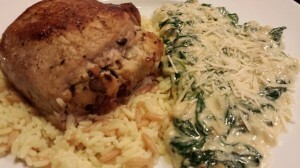 Making food from scratch just tastes better as you will find with this creamed spinach dish. 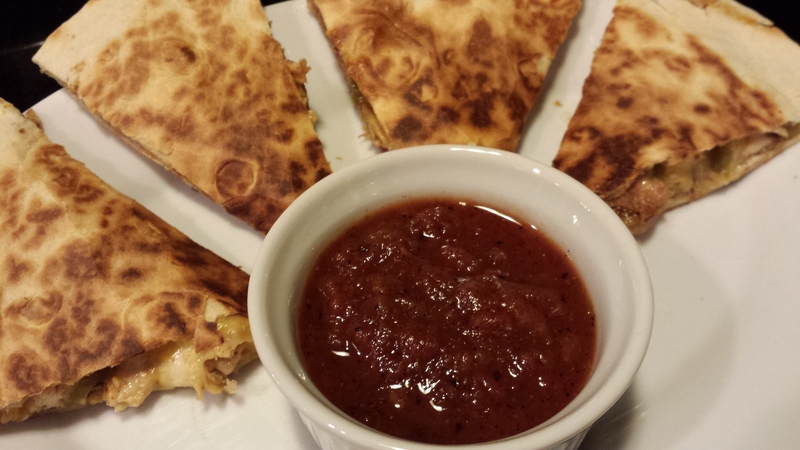 It makes a great “bed” for baked salmon or a seared chicken breast, as well as an accompaniment to a grilled steak. 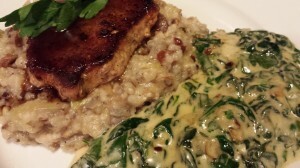 This is by no means a calorie or fat-free dish! However, indulging once in a while, and controlling portion size of such decadent dishes is how we can enjoy our lives — in my opinion. 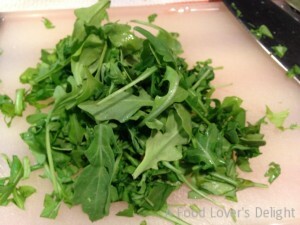 Generally, I will have some arugula (also known as rocket) on hand in the refrigerator which, if not eaten in a timely manner, will get soggy and inedible. 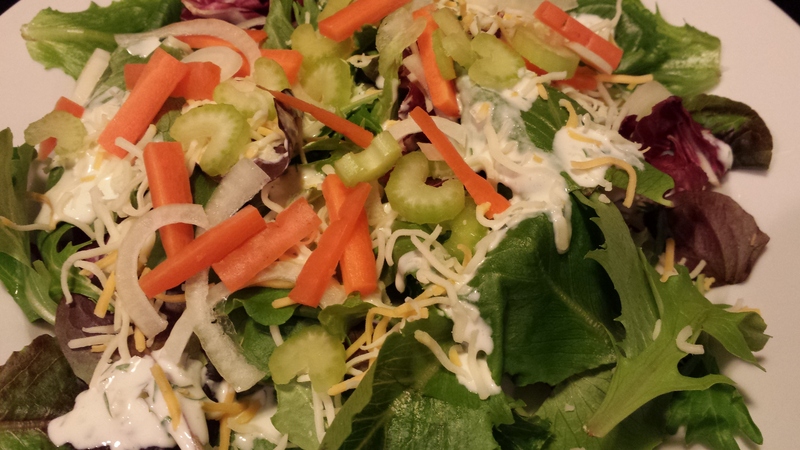 It’s a usual challenge of “what to do with the arugula” before it goes bad. 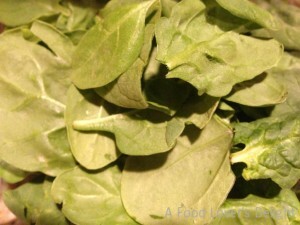 And, I usually have a bag of fresh spinach leaves waiting to be used in cooking or in salads. 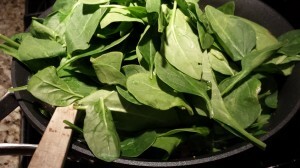 This spinach and arugula dish works like a charm, and arugula that wouldn’t have passed muster in a fresh salad can be used nicely instead of discarded. I love that! And stir a few more minutes while it thickens. 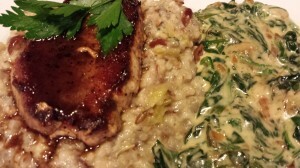 It all comes together pretty quickly into a creamy decadent side dish. Hope you will enjoy it as much as I do! 1. Melt the butter in the olive oil in a non-stick skillet over medium heat. 2. 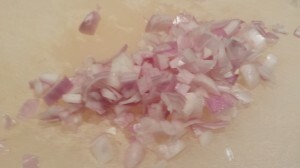 Add the chopped shallots and saute until the shallots are lightly caramelized. 3. 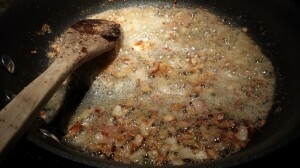 Stir in the minced garlic and cook another two minutes. Do not brown the garlic. 4. 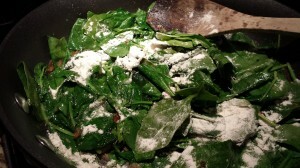 Add the fresh spinach leaves, stirring until the spinach is coated with the butter/oil. 5. Add the flour and cook two minutes. 6. 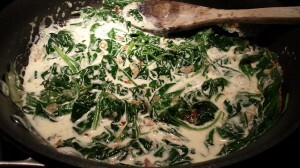 Add the cream and cook until the spinach has wilted slightly but is still bright green and the cream has reduced a bit into a nice sauce, a few minutes longer. 7. 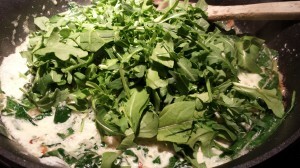 Stir in the Parmesan cheese and the chopped arugula and warm through. 8. Season with salt and pepper, and serve. 9. 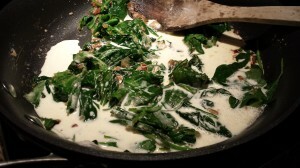 Sprinkle some additional parmesan on top of the creamed spinach and arugula — just like the steakhouse version, except I think my version tastes better! Serves 4 as a side dish. Goes well with beef or chicken and could be served with salmon. Additionally, you can use it as a bed for grilled meat or fish. 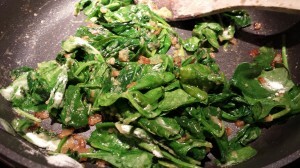 Variations: Omit the arugula if you wish, yet I think it adds a nice peppery flavor. 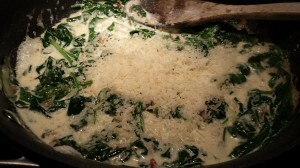 Stir in some shredded swiss cheese if you don’t have parmesan. 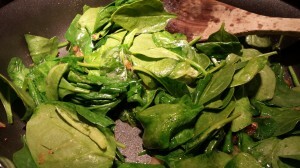 You could use frozen spinach but I find it to be too watery. Use some plain Greek yogurt instead of the cream although the sauce may be a bit thinner. 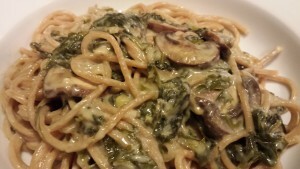 If you have leftovers, toss with some sauteed mushrooms and cooked spaghetti pasta for a different type of pasta dish.